Donnie Darko. 2001. Directed & Written by Richard Kelly. Starring Jake Gyllenhaal, Jena Malone, Mary McDonnell, Katharine Ross, Patrick Swayze, Noah Wyle, Holmes Osborne, James Duval, Maggie Gyllenhaal, Drew Barrymore, Seth Rogen, & Patience Cleveland. 20th Century Fox/Pandora Cinema/Flower Films/Adam Fields Productions. I was born in 1985. When Richard Kelly directed and wrote Donnie Darko, I was about 15 (late birthday always puts me near the end of the year and so I was usually younger than most in my grade). When I saw it, there was an immediate odd quality that drew me in. Like many, I imagined myself an outsider, outcast, whatever word you’d like to use. But Kelly’s film spoke to my weird soul. Donnie Darko combines a story of teen angst with a science fiction-tinged thriller, all wrapped up in a personal family drama. There’s even a horror-ish element within the plot itself, as Frank the Bunny is not simply a sci-fi-esque prophet, he is highly unsettling to look at. Delightfully horror. Set in the late ’80s, the story is quirky, but never so much that it ultimately detracts from anything. In fact, the soundtrack and some of the haircuts, the fashion are what makes it clear this is a period piece, otherwise it isn’t forced on us. But above all else, this movie is concerned with an interesting mix that falls somewhere between a more cynical John Hughes picture and a darkly comedic science fiction-thriller. Often period pieces, no matter the time, can really jam those elements down a viewer’s throat. Kelly does a fine job weaving the late ’80s into his film. Without every pressuring us into a space where neon Spandex, headbands, gigantic hairdos take precedence, the movie gets across its 1988 setting. For instance, from the very beginning we keep hearing mentions of George Bush Sr., more importantly his opponent Michael Dukakis in the ’88 U.S. Presidential election, such as when Mr. Darko’s daughter insists she’s voting for the latter to his chagrin. These particular mentions are organic, they don’t feel jammed into the screenplay. Furthermore, the fact they’re so easily engrained in the fabric of the writing is not only a testament to Kelly’s abilities as a screenwriter, it’s also part of why the film, as a whole, feels fleshed out. The writing is all around excellent. Donnie’s a solid character, as are his family. I’m always at a loss for how I’m meant to relate to characters when families onscreen feel like they’re the furthest away from a family they can possibly get. Sometimes you see these people together as supposed relations and they feel too much like a couple actors working through lines. The Darko family are fun. First, you’ve got the fact Jake and Maggie Gyllenhaal play the brother-sister combo that like poking fun at one another with hilariously foul insults. Their chemistry is, obviously, natural. Better still, Rose (Mary McDonnell) and Eddie (Holmes Osborne) Darko are wonderful in the roles of Donnie’s parents. They’re interesting, they feel like a married couple and likewise feel like parents. Even if Donnie is the main focus, the whole family makes the movie and its story all the better for their inclusion. Aside from characters, the plot is wild, as much as it is intriguing. If you pick up the Director’s Cut there’s a treasure trove of Special Features that make everything even more enjoyable. Sure, you may not like the movie because it isn’t your cup of tea. But you’ve got to admire Kelly’s work, his writing, the time and research he put into the whole thing. On the DVD (this is one movie I’ve yet to pick up on Blu ray), there’s a feature on The Philosophy of Time Travel, the book within the film supposedly written by Roberta Sparrow. It almost serves as a nice footnote to the movie, helping people bridge the gaps between the bits and pieces which may not immediately make sense. Personally, I don’t particularly find Donnie Darko confusing, on the whole. That being said, I’ve watched this so many times in the last 15 years that quite possibly I get it simply because of the sheer number of views. Who knows. However, if you do find it confusing, even in the slightest, I suggest picking up the DVD if you’re willing, and enjoyed the film despite not fully understanding it. The features will help you grasp everything, in my opinion. Again, they also give you an idea of how much work Kelly put into this movie, from writing the screenplay to its visual execution. What I love most is that this is a teen story, at its heart. But more than that we’ve got this great feeling of a distinction between people who are closer to the truth and those who are much further away. The teens, or some of them – particularly Donnie (Jake Gyllenhaal) and Gretchen (Jena Malone) – are obviously on the side of angst, the feeling that grown-ups don’t have it all figured out. This is usually the case in films, and in real life, too. Moreover, some of the adults in this movie are in on that. There’s Professor Monnitoff (Noah Wyle) whose indulgence of Donnie’s questions about time travel point to his better understanding of the world than the closed off, repressed adults here; also, young teacher Karen Pomeroy (Drew Barrymore) is a great example, as she introduces one of the film’s themes, DESTRUCTION AS CREATION, with the Graham Greene short story “The Destructors” that concerns that very same theme. The adults are not simply clueless; no, they are mostly apathetic, and that’s almost worse. Best of all, the character of Jim Cunningham (Patrick Swayze) exemplifies the entire idea that many of the adults here are clueless, oblivious to everything significant about life – when we come to find out about Cunningham, through another act of destruction (creating a better path to truth), it’s easy to see how his preaching about fear is all a cover. Epitomized in Cunningham is the concept of the hidden truth, which Donnie comes to help uncover throughout the course of the plot. Often films that are going for the idea that teenagers are somehow more enlightened in their youth (not all; a small portion) tend to never really feel that way, rather they simply have all the angst and nothing else. Donnie Darko contains every last bit of that angst. Yet more than that with its science fiction leanings Kelly gives this story a legitimate feeling of that youthful wisdom lurking amongst the apathy of suburbia. The central performance from Gyllenhaal is affecting, in many ways. He plays the teen angst so well, seeing him with his therapist in those scenes is often both engaging and also tense in its own right. Donnie comes off as an emotional young man. He represents so many teens in a perfect sense – part of him is dark, the other part calling out to the light. In addition, he feels real. He isn’t a caricature, but instead is a genuine depiction of a teenager, filled with confusing and rage and misguided emotion, and so much more. 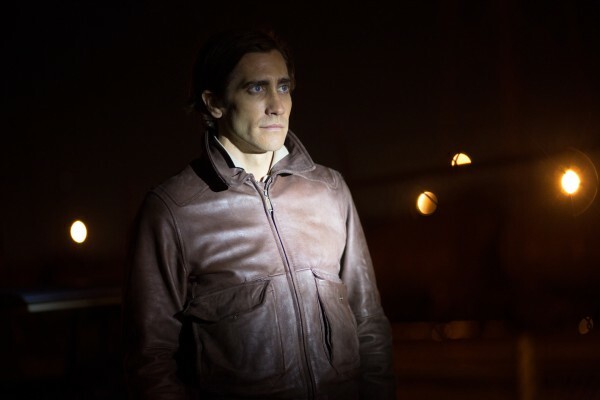 Gyllenhaal truly burst forth with this role. His performance is what keeps us so rooted in the eccentric story. If it weren’t for him, this film might not come off as memorable as it does. Some movies I loved at 15 now don’t look so great. Donnie Darko is not one of those. Like cheese (if you’re into it), this is one experience which only gets better with age. Writing this in 2016, I expected maybe some elements might feel pretentious. They don’t, though. I’ve seen this movie so much, but haven’t watched it in about 7 years. So coming back to it, I wasn’t sure if Kelly’s film might have felt so amazingly effective simply because I was younger, I had those rosy eyes of a still 20-something man. Watching this again tonight, I realize it has nothing to do with me. This film is timeless. If I watch it again, in another 20 years, I expect to feel no different about it. Maybe with more decades behind me the themes, the plot, everything may make even more sense to me then. Nevertheless, right now I can’t stop loving it. Donnie Darko is a hugely interesting piece of work, Richard Kelly still doesn’t get enough credit and his later projects were only more misunderstood than this one. Just don’t discount this one as muddled, as a completely teen movie, or anything like that. This has so much worth inside. Let it wash over you. Some films, as this one is, are an experience rather than merely a bunch of moving images telling a story.